Light Reflections Exhibition – Lansdown Gallery – Stroud. 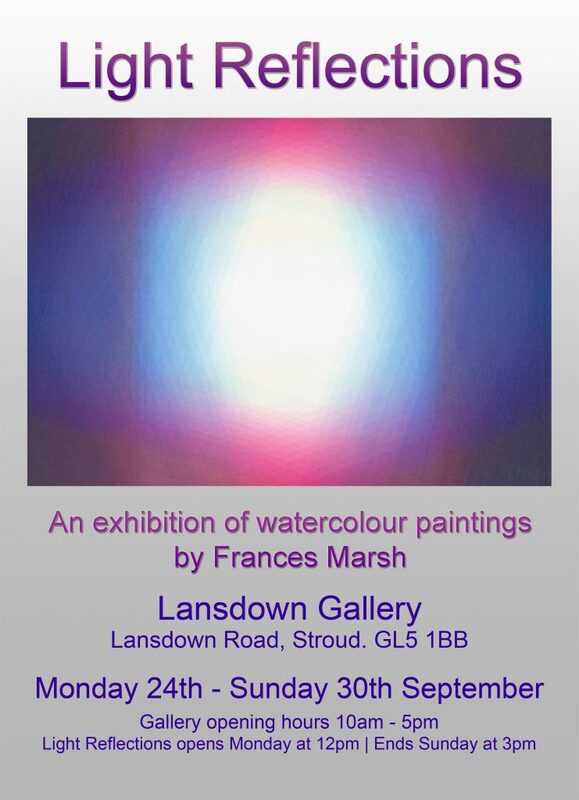 This week long exhibition at Lansdown Gallery in Stroud is a wonderful opportunity to view this unique collection of vibrant watercolour paintings by Frances Marsh. They are individual radiant gems of colour, light and space. These extraordinary paintings were last exhibited within the stunning cloisters of Gloucester Cathedral and Dean’s Chapel at Worcester Cathedral. High quality Gilceé prints of all Frances’ paintings are available to purchase or order during the exhibition or at any time via her online gallery via the Sales Page. If you are interested in putting on an exhibition of paintings from Series Four & Five, please get in touch via the Contact page. Please click here see testimonials.